Time for the Sept 5th Freebie/Coupon Round-Up! There are so many great deals, coupons and freebies posted to the Frugal Freebies forum every day - I am re-posting them here so you will find all the best deals (+ more) for the day - in one place! I hope this helps save you time and money! US COUPON - Get a coupon for $3 off BreathRx. Hey fans! We are giving away 400 bottles of Purex with Zout this Wednesday. The giveaway starts at 1:00 pm EST/10:00 am PST. They are going to go fast! AMAZON DEAL - Labor Day Clearance - Save an additional 25% on thousands of of select styles* for women, men, and kids sold by Amazon.com. Check out the entire selection or browse by women's shoes, men's shoes, girls' shoes, boys' shoes, or handbags. Offer ends September 5th. *Discount taken at checkout. 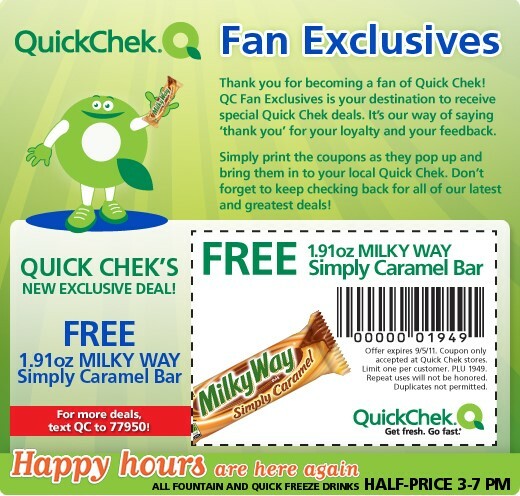 US FREEBIE - Free Milky Way Simply Caramel Bar from Quik Chek. Expires today - Sept 5/11. US FREEBIE - Free Cookbook Kit - includes Cookbook Publishing Guide, sample cookbooks & interactive CD which also includes FREE typensave® software. US FREEBIE - Free Shout Wipe & Go wipes! Page states they have a limited number of samples available - first come first serve basis only, so hurry to grab yours!